This phone is very similar to the Lumia 920. 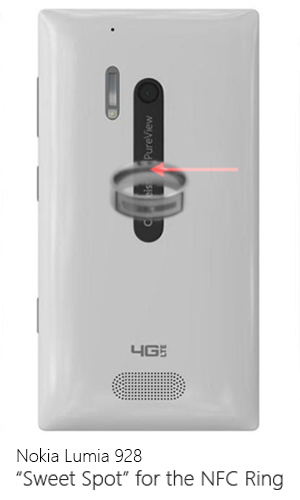 The sweet spot is in the middle of the silver strip on the rear of the device, right on the bar that separates "Carl Zeiss" and "Pure View". Orient the ring perpendicular to the silver strip (parallel with the silver bar) to get a clean read. I was unable to test with a case, but can get a clean read from about 1 cm away using the V1NTAGE ring (not the alpha). You can see the sweet spot here. I should also mention that this test was with the V1NTAGE ring, not the alpha. Is it safe to use hand sanitizer (e.g., Purell) while wearing an NFC Ring? Will using hand sanitizer (e.g., Purell) have any negative consequences for the layer of epoxy on the ring? I use it quite often, and hadn't even considered it until I received my ring today and was reading through the paperwork that came with it. Has anyone had experience with this (not willing to sacrifice mine for the sake of science on this one)? I was actually just working on that. You can see the sweet spot, and the correct ring orientation here. The orientation is critical for getting it to read on this device. Sweet spot is immediately under the rear camera lens. Ring must be oriented such that it is perpendicular to the silver bar (i.e., makes a cross with it). 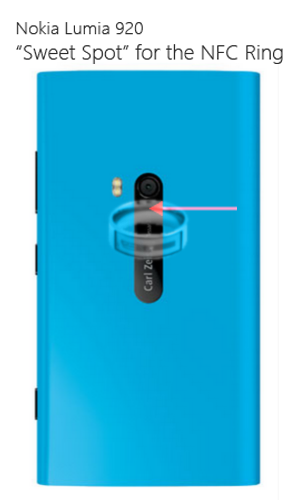 Have not yet tested with a case since I do not have one, however it does read from ~1cm away through the air, and it reads through a thin layer of cardboard (at the very least) as well.